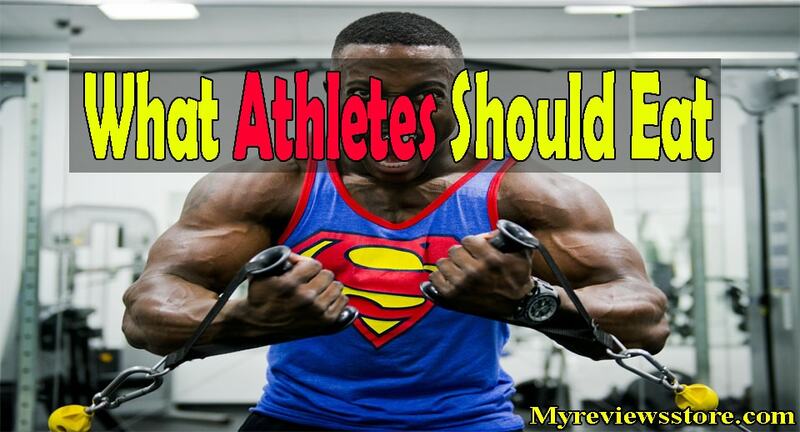 Athletes.. when you hear the word, you visualize a sportsperson with a super fit body. Now the question is, to have this fit body is it super easy? Well, honestly no, there is a lot of dedication and sacrifice is working behind this fit body. The main thing is eating habit. Sorry to disappoint you if you love to eat pal, but to be a winner athlete you have to know what athletes should eat. You will need a healthy diet plan to achieve your goal. You have to eat a combined meal that has fats that is healthy, fiber, vitamins, protein and carbohydrates. You will get best results for the right choice of foods. Here in this article, you will get a proper guideline about eating habit and a bonus healthy recipe that you can make it with a grill pan easily. So what are you waiting for, get ready to gobble up the information and apply it to be a super athlete. Store a lot of carbohydrates before any long time workout. They work as glycogen in your body that gives you the energy to do enough workout. Pasta, fruits, vegetables, and cereals are the best source of carbohydrates. Before going for any workout take your meal at least 3-4 hours before. Take enough protein because they work with your muscle and help to maintain it. Milk, poultry, fish, beans are the best source of protein. Make fluid your best friend. Don’t wait for getting thirsty, just take water very often. It will keep you hydrated all the time. As you are an athlete, you know that you sweat a lot. With sweat, your body loses a lot of electrolytes. Make up the loss with lots of drink. You can take banana or apple slice with peanut butter. Different kinds of energy bars. Sandwich with tuna or lean beef. All these snacks are healthy and will help you to stay energetic during your activities and workout. #3.For launch take a low-calorie meal. Try fruits, vegetable, chicken salad. #4. Take snack that has low calorie in the afternoon. #5.Now for dinner take a proper vitamin, fiber, and carbohydrate. Remember to take dinner early. It will help to balance your energy. Don’t even think of drinking diet soda. It is only full of lots of sugar with no calories. Get healthy drinks instead. Canned soup is not good for an athlete body. They are responsible for high blood pressure. Avoid cereals with sugar. They will make you fatty. Say bye bye to alcohol. It is really harmful to athletes. Eat salad without any salad dressing. Avoid any kinds of protein powder. They are not good in any way. There is no such thing as a sports drink. They are just drinks with full of sugar. Now you may think of what you will have when you are in training. Well, as I said before I have a bonus recipe for you. Let’s check it out.I will tell you a delicious and healthy meal that you can make with a grill pan easily. Why use this pan? If you love to grill food but for space and health issues you have avoided it. But with a grill pan, you can easily make food that is healthy and delicious. You can use it on stoves and burner also. Boneless chicken breast to make steak. Bell papers large in size. Cut into 1-2 piece. Take the pan and preheat it over medium heat. Then take 2 tbs olive oil and add it to the pan. Use pepper and salt on the meat. When you see the pan is hot then cook the meat for 4 to 6 minutes. Flip it when it did on one side. When the cooking process going on, take your favorite vegetable in a bowl and add salt, pepper and olive oil with it. When you find that your chicken is done then remove from the grill pan and let your chicken steak cool down. Take your mixed vegetables and cook it in the pan until they get soft to eat. Now remove the pan and take your chicken and vegetable on the plate. Yes, it is done. Easy and delicious. Any athlete can have this food anytime. Now, I think you are now full of information about diet plan for any athletes. As you can see it is not difficult as it sounds but it does require lots of dedication and sacrifice of taste buds. If you are a food lover than it will be very hard for you. But if you want to be a super athlete with a fit and energetic body, you have to follow an athlete diet plan. Follow it and do workout regularly, you will see you have reached your goal in no time. Honestly speaking, it is not for only athletes, if you want to lead a healthy life, follow this lifestyle. You will be happy and healthy.